Carrying capacity. Safety. Comfort. And serious fun. When you need the vehicle that does everything, hire a pickup. It’s the versatility that makes pickups such a popular choice. For business and pleasure, a pickup has the scale and carrying capacity to handle a wide range of loads. Its suspension gives it the sort of ride comfort you’d expect from an SUV, with the power of a reliable workhorse. And it’s built for toughness on rough terrain. Need to carry more people? Ask us about the 5 seater Hilux. 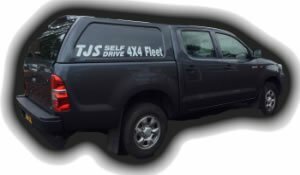 What do I need to hire a pickup from TJS? Hire your pickup now. Complete the booking form or contact your local TJS branch on the right of this page.